The value of custom video on your website is high. For whatever reason, the majority of dentists are not incorporating video into their websites. So, when you add video to your site, it tells your patients you’re cutting-edge, because you’re one of the few who’s not afraid to use it! When you watch someone’s home video, it gives you insight into the kind of person they are; you know, most of us aren’t Academy Award-winning actors with built-in editing equipment, so it’s a raw glance into that person’s world. By using video on your website, you are providing that same glimpse into your business world for your existing and potential patients. 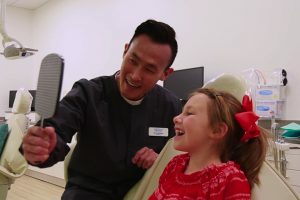 You can use video to introduce your practice, and as a way to “Meet the Docs” and “Meet the Staff.” By taking advantage of video in those cases, you’re answering the all-important question of “who’s going to be taking care of me?” It provides a personal connection to your staff, which puts your patients at ease before they even schedule an appointment. When viewers visit your site and want to find out more information, odds are they will be more drawn to watching a video of you telling them about your practice, versus reading the long, sometimes mundane, text “about you.” Bottom line, when visitors watch a video, it makes them want to learn more about you and your practice, which leads to them making a call to schedule an appointment. This is a prime case of converting visitors into patients. And, now you’ve grown your practice. If your visitors are coming to your site via a mobile phone and watching a video, then the call-to-action is even easier – with a “click-to-call” option, they can call you directly from their cell! You’re not only answering any questions they might have of you, but you’re also making it easy for them to go from inquisitive visitor to patient. When you add video to your site, you’re not only setting yourself apart from your competition, providing a personal connection, and converting visitors into patients. You’re also getting your virtual “stamp of approval” from Google, in terms of what this means for you in searches. Google indexes videos present on sites and optimizes searches accordingly. So, when someone is looking for a “dentist near me,” and you have a video on your site (as opposed to your four competitors in your zip code), you’ll place higher in the Google search engine rankings. What an advantage! 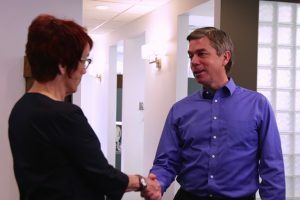 When TNT does a video shoot, we capture enough video to market the practice online for one to two years. By contributing video content to your website each month, in addition to written content on the website itself or a blog, we’re providing a 360-degree marketing approach that gets results and sky-rockets your SEO. 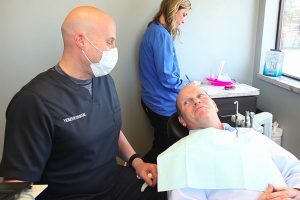 Video can be the edge you have against your competitors, because most dentists truly aren’t taking the time to a) get it done, and b) formulate a proactive marketing strategy around it. If you’ve got video on your website, great! But, that’s not the only place to use this wonderfully crafted video message to your patients. Where else can you turn to post these videos and be effective in your messaging? You’ve seen it time and time again; you’re scrolling through your News Feed and see a promoted video from an organization you “like.” Well, your practice can do this, too! If you consider that 70% of all content consumed on the internet was introduced on Facebook, you have a wealth of opportunity before you. If you don’t have a Facebook presence, then in most cases, your video will not be seen. The moral here is make sure your Facebook page is up to par, and in addition to posting on your site, make sure you post on your Facebook page. YouTube is the second largest search platform on the internet. It’s not just for cute cat videos or watching the latest musical group try to make it big. It is made for people looking to tell others about themselves, which is exactly what you’re trying to do with your practice! When you have your own videos, you can create your own YouTube channel and promote your practice accordingly. That’s a win! When you consider that “video is projected to claim more than 80% of all web traffic by 2019,” you’re missing out if you don’t have video on your website, Facebook page or YouTube channel. If you need help creating video for your site, give us a call at TNT Dental! We’re happy to take you from a bland page like your competitors to a vibrant one, full of interactive and engaging content, and help grow your practice!